The field shows two voluted pedestal-like compartments, each supporting a large vase of flowers, flanking a smaller pedestal-compartment in the center. The sculptured bust of a figure of indeterminate gender rests on the central pedestal. A square-necked garment and drapery cover the shoulders; there is a diadem of laurel leaves on the head. The entire bust is rendered in shades of yellow, suggesting gold. The contours of the pedestals are defined by arabesques of strapwork and acanthus leaves which continue in an unbroken line around the edges of the field; at the top, they form a triple arch above the three pedestals. Two thick garlands of flowers stretch from the center of the middle arch to apair of acanthus volutes flanking the bust. Smaller garlands of flowers, and shells, decorate the upper parts of the two pedestals at the sides, and a basket of flowers fills the middle the middle of the central pedestal. A number of birds occupy other spaces a great eagle with outspread wings in the center of the pedestal. 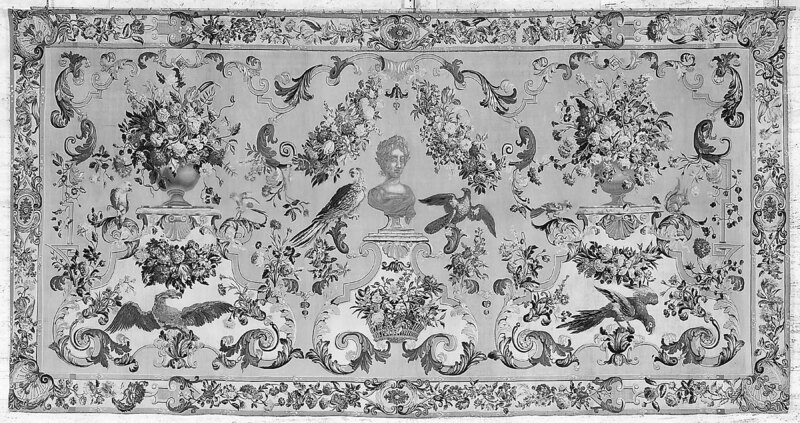 A number of birds occupy other spaces: a great eagle with outspread wings in the center of the pedestal at the left, a parrot in a corresponding place at the right, a parrot and eagle flanking the bust in the center, two smaller birds of the parrot family flanking the vase at the left and a bird and squirrel flanking the vase at the right. Sprays of flowers fill the rest the rest of the space in the field. The color of the field inside the arabesques is light fawn; outside, the ground is bright yellow. The border shows bunches of flowers alternating with strapwork and acanthus arabesques on a fawn-colored ground. An oval cartouche enframing a stylized rosette appears in the center of each segment of the border, and a great palmette-shell motif decorated with leaves and bell-shaped blossoms fills each of the corners. 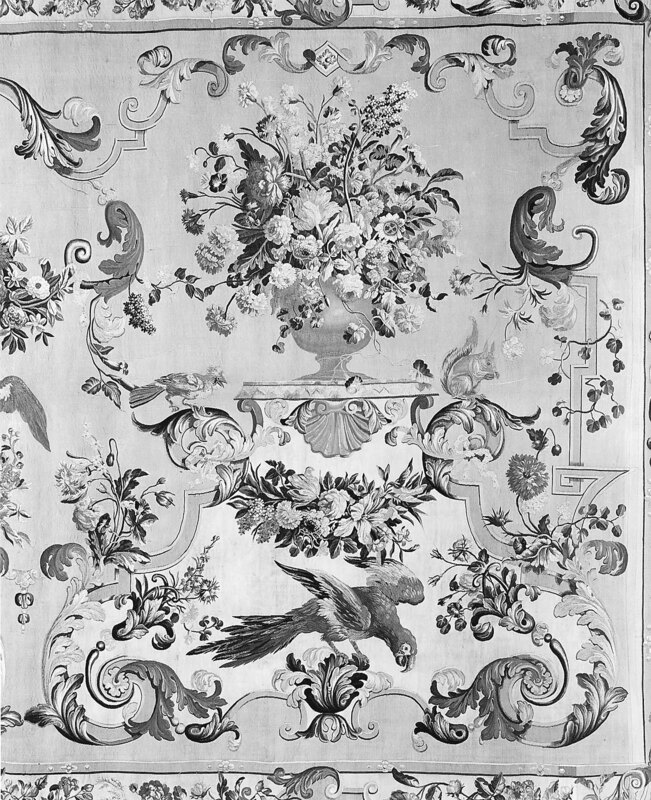 H. C. Marillier, English Tapestries of the Eighteenth Century (London, 1930), p. 10, no. 3, where three related tapestries, all from the Spanish Art Gallery, are discussed. 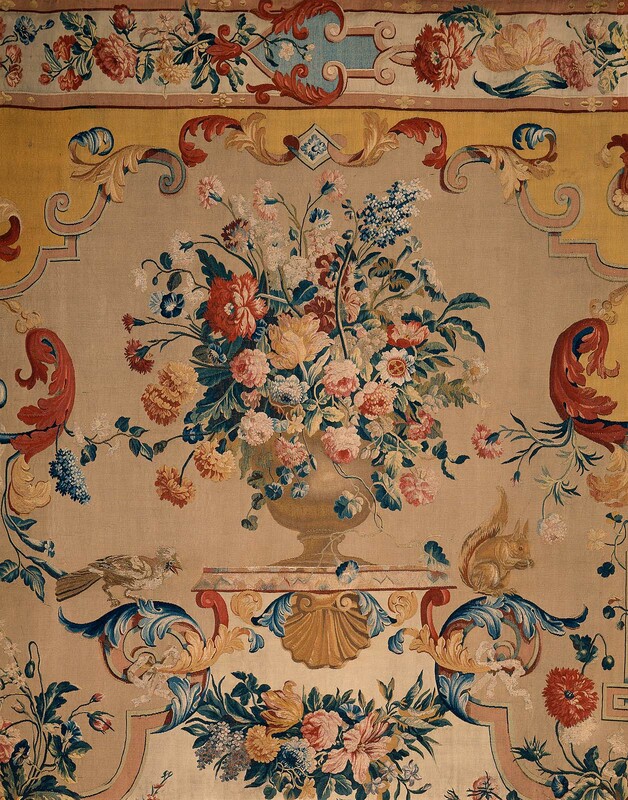 Mrs. Rice had two of the related tapestries that were mentioned by Marillier, 1930 (as above, n. 1), which she sold at Parke-Bernet in 1965 (lots 343 and 344). The provenance of lot 343, which is not the MFA tapestry, was given in the auction catalogue as the Spanish Art Gallery, French and Co., and Mrs. John E. Rovensky. The provenance of lot 344, the MFA tapestry, is presumably the same, but is said in the catalogue only to have come from French and Co.